So, a cold virus has me a little behind this week with my review for The Last Metro, but I promise I will have it up as early as I can this coming week, with reviews of the rest of Criterion's March releases soon to follow. My editor at Oni Press, James Lucas Jones, grabbed me a copy at New York Comic-Con, and I just got my hands on it today. 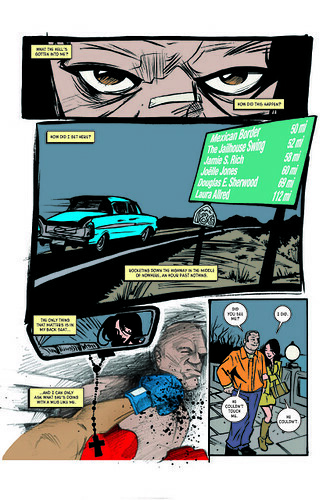 The book contains five crime stories, somewhat in an EC Comics/Alfred Hitchcock Presents vein: short pieces with a swift kick in the end. All the tales are drawn by different artists, all with different yet complementary styles tied together by the matching coloring approach. Artistically, there are shades of Paul Pope, Phil Noto, Mike Oeming, and the comics series Criminal, and yet every story is drawn with its own unique spin. If you like any of those other guys, you oughta like Egg, as well. Read more about Egg at Eric's blog. Online sales to come soon. Edit: And here thet are. 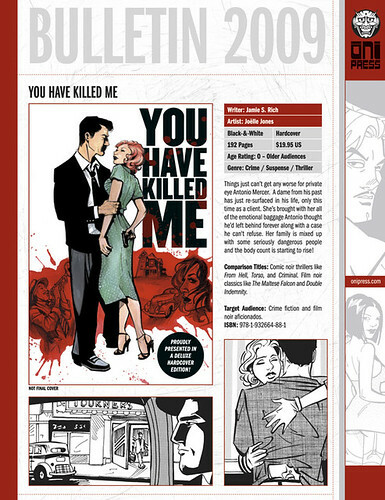 Next is our full-length take on the old-school private detective genre, the graphic novel You Have Killed Me , coming from Oni Press in May. Click on the image below for more information. We're both really proud of You Have Killed Me. I just received the first lettering proof today. 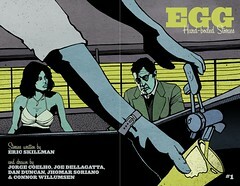 By no small coincidence, in the same envelope with my copy of Egg #1. For whatever reason, I never actually read Murder Me Dead. At some point I accidentally fell off the Stray Bullets train and never got back. I don't recall why. Maybe a misguided decision to "wait for the trade." I can confirm that decision was indeed misguided--Stray Bullets might be my favorite series of all time! Murder Me Dead is a slightly different animal, though--much closer to a classic film noir vibe than the '70s-style nihlism of SB. But both are definitely worth your time. It's still shocking to me that those collections (and the series proper) don't sell well enough for Lapham to continue publishing them--is there no justice? When do the bailout checks for comics creators start rolling out?